Aberdeen headed north from Dens with full points after a 2-0 win over the Dark Blues. Sam Cosgrove put the Dons went ahead with a penalty after 58 minutes. The game had been even and well contested by the Dee until then but Aberdeen went on to take charge and Cosgrove added a second as the visitors ended the game pushing for further goals. Cammy Kerr and Craig Curran returned to the Dark Blues’ starting 11, replacing James Horsfield and Kenny Miller, who were on the bench. Callum Moore came in for his debut in the place of the injured Martin Woods. Aberdeen’s only change was Greg Stewart, who started instead of Dean Campbell. Aberdeen had the edge in the early exchanges and Lewis Ferguson went close with a free kick that deflected off Dundee’s defensive wall and looped over the bar. The Dons forced a series of corners in the firsrt 20 minutes, but failed to do much with them. 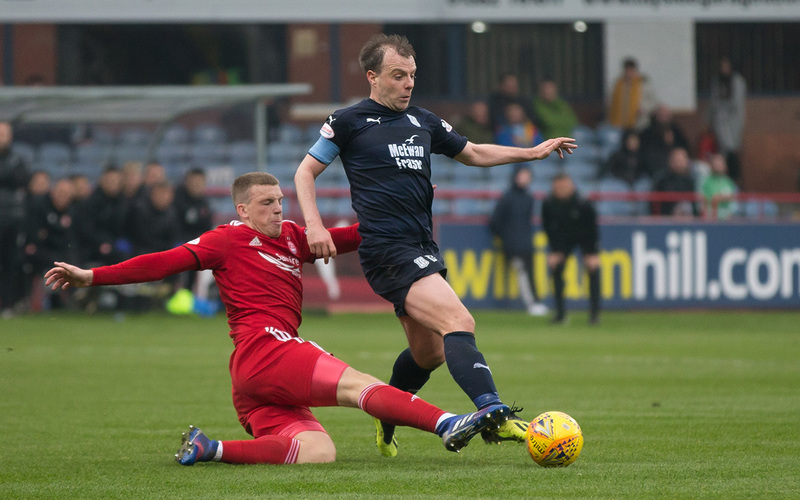 The Dark Blues maintained their concentration in defence and prevented Aberdeen creating any real danger for most of the first half. Dundee grew in confidence as the half wore on and had a few moments of real danger. John O’Sullivan broke free on the left, and with Dark Blue shirts pouring into the box his cutback was blocked by Andrew Considine. Ethan Robson came closest to a goal before the break. Nathan Ralph’s free kick from deep was headed clear and Robson controlled the ball with his first touch then lashed a shot against the post from 20 yards. The Dark Blues were working hard and crashing into their challenges in midfield. Aberdeen struggled to get their game together and build attacks in the face of Dundee’s furious pressing. Darren O’Dea limped off the park to be replaced by Genseric Kusunga late in the first half. Aberdeen were reduced to some optimistic appeals for penalties as they struggled to create serious danger in open play. Only in first half injury time did they have the Dundee defence in trouble when Seny Dieng spilled a Stewart cross under pressure, the ball being cleared safely before the Dons could take advantage. Dundee had ended the first half promisingly and started the second half well. They might not have been fluent, and their passing was hardly slick, but by sheer effort they regularly forced the ball into the Dons penalty area, without troubling goalkeeper Joe Lewis. The nearest thing to a Dundee goal came when O’Sullivan made space well and thrashed a 25 yard shot just over the bar. Only a minute later Aberdeen broke quickly from defence down the left. Lewis Ferguson’s run into the penalty area was ended by Callum Moore’s trip and Sam COSGROVE sent Dieng the wrong way from the penalty area. As so often this season the goal transformed the game. 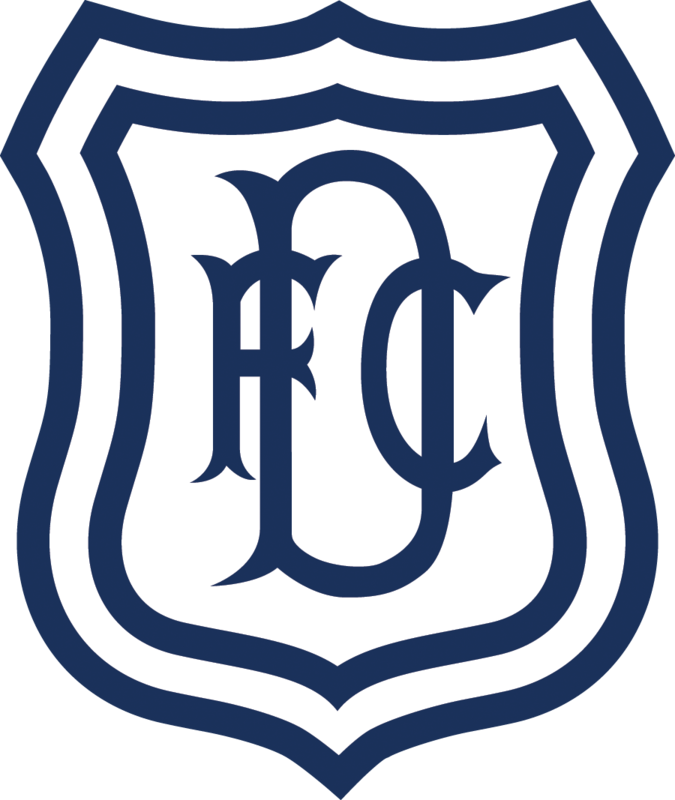 Dundee had been highly competitive, with the possibility of a rare home win seeming realistic. But once they fell behind the Dark Blues dropped out of the match. Andrew Nelson and Kenny Miller came on for Callum Moore and Craig Curran, but by then the zip had gone from the midfield and the stikers had nothing to work with. Aberdeen’s second goal came from a fine piece of skill by Connor McLennan who ran in along the byline before slipping a pass into the goalmouth for COSGROVE to shoot home. For the remaining 15 minutes Aberdeen were cruising, unrecognisable from the side that stuttered for the first hour. The Dons could well have added to their lead and it took some fine saves from Dieng to keep them out. The keeper saved well from McLennan after Shinnie and Stewart had combined slickly for Aberdeen’s best move of the game. Dieng then pulled off further good saves from fierce drives by Shinnie and substitute Stevie May. The game ended as it had started with a Lewis Ferguson free kick taking a nasty deflection off the defensive wall and Dieng did well to touch it onto the top of the crossbar. For the first hour today Dundee battled well but when they fell behind they couldn’t respond. There were spells in the first hour when the Dark Blues looked little like a team struggling at the bottom of the league on a depressing run of six defeats. However, once Aberdeen took the lead all confidence drained out of the Dundee players and the Dark Blues were a beaten side long before the final whistle. Unused subs: Parish (gk), Dales, Hadenius, Horsfield. Booked: McGowan (foul on Cosgrove), Ralph (foul on Stewart). Unused subs: Cerny (gk), Halford, Devlin, Wilson. Goals: Cosgrove (58 pen, 76). Booked: Lowe (foul on Kerr). Referee: Andrew Dallas. Assistants: Alan Mulvanny, John McCrossan. Fourth Official: Lloyd Wilson.